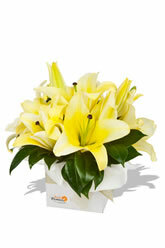 This superior arrangement of pastel yellow coloured Oriental Lilies in a beautiful cluster is a sight for sore eyes. What you have here is an angelic little gift that can bring comfort to a troubled mind or joy in celebration of a festivity. Crème de la Crème will be appreciated by one and all, for any occasion.Lilies may be sent closed/partially closed in order to prevent damage and to last longerAdd to the pleasure of sending flowers, not to mention receiving them, by sending a bottle of Moet and Chandon along with your flower arrangement. i ordered flowers to celebrate the arrival of a new baby boy. i was promised that the flowers would be delivered in 24 hours, and they were! my niece was delighted and sent a photo. They were beautiful! Thanks so much the flowers were gratefully received. Loved your website made life so simple! 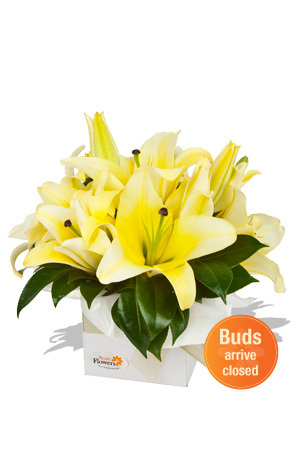 Received a birthday reminder with details of a previous delivery - so very easy to re-order. Selected lilies unavailable but we're promptly and courteously offered a replacement choice which according to the recipient were just beautiful. Thankyou zFlowers.com. I WAS VERY IMPRESSED. FIRST TIME USED zFlowers.com. ORDERED ABOUT 12.45 PM AND DELIVERED BY 3PM. SISTER IN LAW SAID THEY WERE BEAUTIFUL AND PLENTY OF THEM. THANK YOU' A HAPPY USER OF YOUR SERVICE.